CARDS & TIN IN GOOD CONDITION, BOX IS A BIT TATTY ON EDGES SEE PHOTO, AS THEY HAVE BEEN PUSHED IN A DRAWER FOR QUITE AWHILE. Series: Rick and Morty. The color may be a little different due to the effect of light and moniter setting. 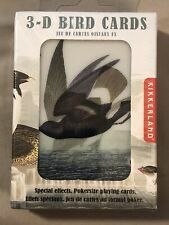 New & Sealed 3-D Birds Playing Cards. I strive to give you 5-star service! 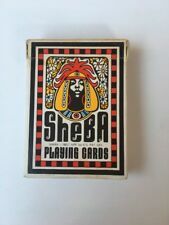 SHEBA Playing Card, Poker Size, Copyright 1972 Made by Sheba Products, A Division of Omega Concepts Ltd., New York, New York 52 cards, 2 jokers, 1 original box - cards are plastic coated/linen finish. Vintage 1979 Coors, bridge size playing cards. In plastic unopened. Melbourne Ales Playing Cards 1950s. Purple. Nice original unopened full packet of playing cards from the 1950s. Advertising Melbourne Ales of Leeds. Purple in colour. Melbourne were bought out by Tetley's of Leeds in 1960. Bells Whisky Patience Playing Cards,Limited Edition,New Sealed 2006,Collectable. Condition is New. Dispatched with Royal Mail 2nd Class. Vintage 1970's Gold Miller High Life Beer Playing Cards Brand New Sealed. Please see photos. Shipped USPS First Class Package with Tracking. I ship fast. Thanks for looking. 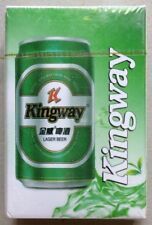 Carlsberg Beers single playing card ,in good condition this is a single card and not the deck of cards a brewery card. DALE EARNHARDT JR. PLAYING CARDS. ORIGINAL UNOPENED BOX. Black case holds 2 complete decks of Schaefer Beer playing cards. I point out any defects that I see if there are any. I will always try to work things out so we are both happy. Cards are used and show minor wear. 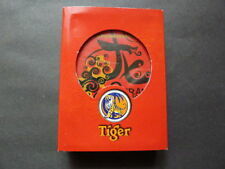 Sealed TIGER BEER Promotional Playing Cards - GOOD PROSPERITY - from Guinness Anchor Brewery (GAB) in MALAYSIA in 2018.a great addition to any collection. From: Tiger Beer. 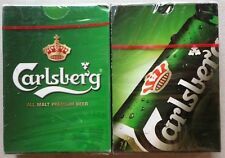 Grolsch Lager Beer Poker Bridge playing cards - cards are sealed inside of box. Great little gift for the person that loves JD. 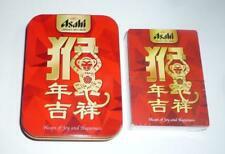 One deck per tin. Pick Up is available from the THORNLEIGH area NSW 2120. IT STANDS 6 1/16" TALL WITH AN OPENING OF 3 1/4". BASE IS 2 1/4" ACROSS AND IS SUNKEN TO A DEPTH OF 1/4". HAS A BLACK "BICYCLE" LOGO ON FRONT WITH THE WORDS "TRUSTED SINCE 1885". Bells Whisky Playing Cards in great condition from 2006. CONDITION - Excellent - unused - still in original cello wrap which split when I dropped it (see last photo). Item as shown. Excellent condition still sealed. This item is Mid-Century. The cards are Stardust Plastic Coated with the Stroh's Beer Emblem and the Stroh's Beer For Beer Lovers written on the front of each card. Both decks are highlighted in Yellow and Red. Because of this almost all we list will have the normal amount of wear expected based on the type of item, age, handling, and storage.